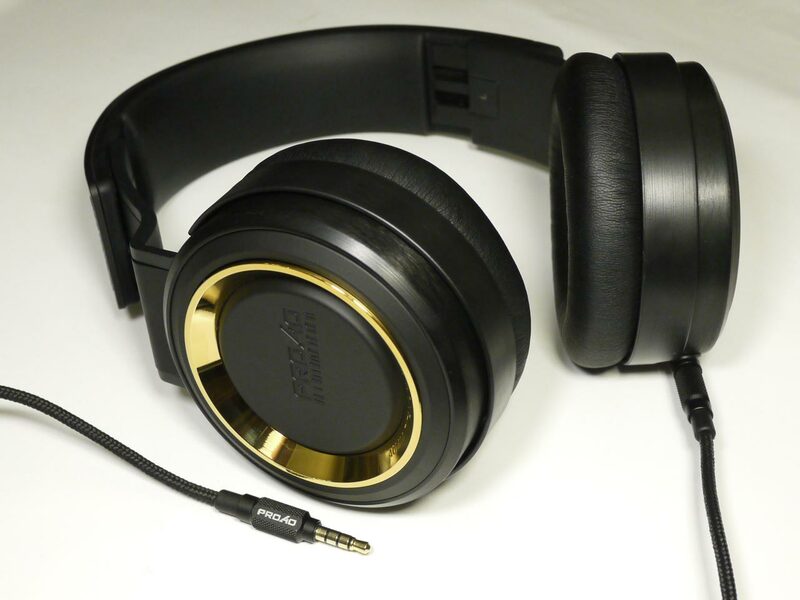 Build Quality (10/10): The construction of the PRO40 impresses right out of the box – the headphones are built largely out of a durable aluminum alloy and the few parts that aren’t, are made of hard, sturdy plastic. The rubber headband pad and pleather earcups are soft and pleasant to the touch. The 3.5mm jack is located on the left earcup and the headphone comes with two interchangeable cords – a nylon-sheathed portable-length cable with microphone and 3-button remote, and a long coiled cable with ¼” adapter for studio use (note: the coiled cable will not be included in the box with the first batch of the headphones, but will be available to customers at no additional charge via the Munitio website). Both cables are very well-made, utilizing high-grade materials and a design that shows good attention to detail. The headphones also come with a very sturdy hard-shell carrying case. Comfort (8.5/10): Despite the bulletproof construction, the PRO40 is not a heavy headphone and fits on the head very securely thanks to what Munitio calls CODA AXIS technology – a mechanism that affords the earcup a wide range of motion independent of the rest of the headphone. The same mechanism keeps the headphones comfortable, though the protein leather earpads can get a touch warm with extended wear. Isolation (8/10): The soft pads and adjustable fit provide a good seal between headphone and ear. Isolation is above average and noise leakage is average for a headphone of this size. Sound (7.75/10): Not unlike Munitio’s in-ear earphones, the company’s first full-size headphone delivers smooth sound underpinned by powerful bass. The bass response of the titanium-coated drivers used in the PRO40 beats everything I’ve heard since the Denon AH-D1100 in quantity, boasting both great impact and depth. The PRO40 sounds bassier than the vTrue model from subwoofer manufacturer Velodyne, and much bassier than the V-Moda M-80. Some bloat is to be expected considering the bass quantity, but on the whole the PRO40 holds up rather well. Its bass tends to be more intrusive in comparison to the Velodyne and V-Moda sets but remains tighter and more controlled than that of the Klipsch’s Image One, another bass-heavy portable headphone. The midrange of the PRO40 gives up some clarity and prominence as a result of the bass emphasis but has a rich, warm tone and still maintains better resolution compared to many other enhanced-bass models. The mids are thick enough that they don’t get crowded out, avoiding the type of heavy midrange veiling that plagues many other headphones of this type. The top end of the PRO40 is relaxed, but not as rolled off as with the Monoprice 8323 or the classic Sony MDR-V6. The sound is smooth and forgiving, with treble presence about on-par with my V-Moda M-80, but much bigger bass. The Monoprice 8323, for example, sounds quite dull and lacking in dynamics next to the Munitio set and the Denon D1100 isn’t as smooth. The presentation of the PRO40, too, is a little more even than with the Denon set. Whereas the D1100 has a well-layered but intimate presentation, the PRO40 is less forward and a little more versatile. Worth noting also is the high sensitivity of the headphone – the PRO40 is very easy to drive and reaches high volumes as easily with my phone as it does with the HiFiMan HM-901 or a desktop amp. Value (7.5/10) The Munitio PRO40 is quick to impress with superb build quality and a compliant, comfortable fit. The headphones boast a much better construction than similarly-priced sets such as the Skullcandy Mix Master and Audio-Technica ES10, and back it with a 2-year warranty. The sound loses a bit of refinement to the enhanced bass but is fun and capable all around. Overall, the PRO40 is a good bass-heavy headphone with bulletproof construction, and a great full-size adaptation of Munitio’s in-ear earphones.